Blood types for nursing: As a nurse we must be familiar with the various blood types along with their compatibility. This is not only important for the NCLEX exam but the job! In nursing we administer blood transfusions, but before we do this the patient must be typed and crossmatched. Therefore, the patient’s blood will be typed (are they O, A, B, or AB and what is their Rh factor, negative or positive?) and crossmatched with a donor. 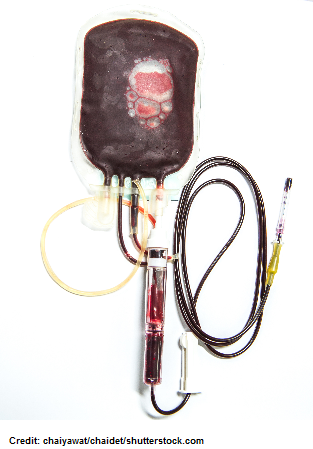 The donor’s blood must be compatible with the patient’s to prevent a transfusion reaction. So in other words, as nurses we want to be familiar with ABO blood types and who can donate/receive from who! What is found in blood….that awesome red substance in our veins? Red blood cells (RBCs): helps carry oxygen throughout the body with the help of the protein hemoglobin and helps remove carbon dioxide from our body to be exhaled by the lungs. There are 8 total blood types from four different blood groups (A, B, AB, O). How are there eight types? Patients can be A+ or A-, B+ or B-, AB+ or AB- and so forth. The positive or negative part comes from the Rh factor, which is discussed in depth below. To understand the different blood types and who can donate/receive from who you MUST understand the concept of ANTIGENS and ANTIBODIES. 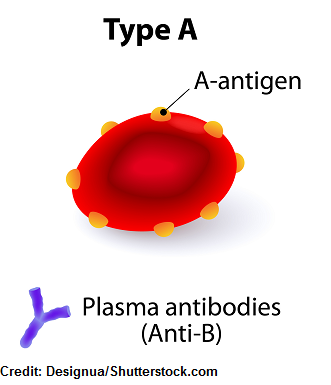 Antigens are found on the red blood cell’s surface and antibodies are found in the plasma surrounding the red blood cells. 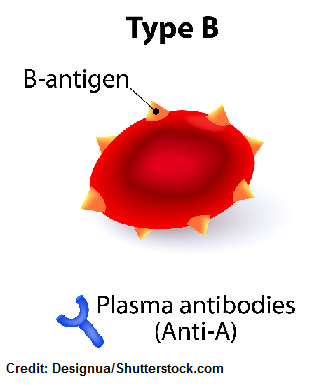 Antigens: can be present or absent on the surface of RBC. All RBCs have them EXCEPT Type O RBCs. These are proteins that can illicit an immune response when they come into contact with its corresponding antibody. So in short, they stimulate the antibodies in the plasma to defend the body. 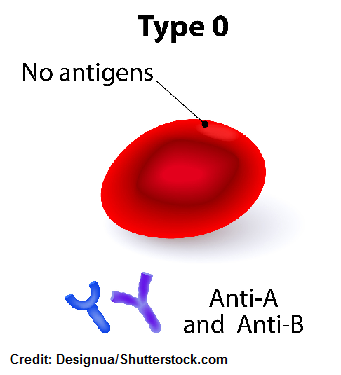 Therefore, if you get the same RBC antigen and antibody together this will cause an IMMUNE RESPONSE called agglutination. This is where the RBCs will glue together (hence clump together) and the donor’s red blood cells will lysis. This is known as a hemolytic transfusion reaction. Therefore, you have to watch what antibodies are present in a patient’s blood compared to the type of antigens present on the surface of the RBC from the donor. Antibodies: protect our body from invaders. 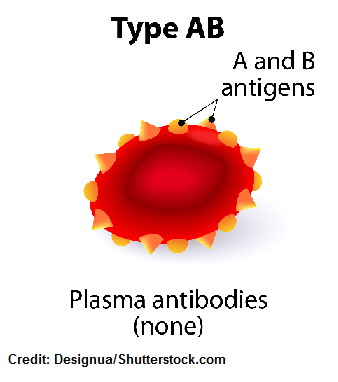 All blood types have antibodies present in their plasma EXCEPT Type AB. They are found in the plasma surrounding the RBCs. 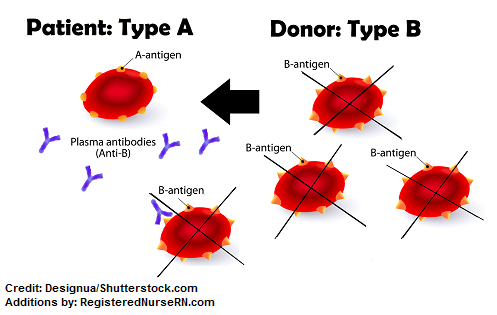 Again, the recipient’s plasma antibodies must be the opposite of what type of antigen is found on the donor’s red blood cell. If they are the same it will lead to a transfusion reaction. What is Rh factor? In simple, these factors are either found on the surface of a red blood cell or not. Either a person has them or they don’t! If the factors are present on the RBC, the person is Rh POSITIVE. If the factors are absent on the RBC, the person is Rh NEGATIVE. IMPORTANT! If a patient is Rh positive they can receive either Rh+ or RH- blood. On the other hand, if a patient is Rh negative patients they can receive only receive Rh- blood. A patient is A+. What blood can they receive? A patient is A-. What blood can they receive?